The beautiful songster is actually a tropical girl. Born to a Guyanese-Surinamese-Barbadian father, and a mother of German extraction. Onika Rollins, stage named Onirose, bloomed in sunny Guyana before making Barbados and Germany her home. Onirose is an anagram which combine her first and last name. The alias, like her heritage, is a mesh of significance. In the spring of 2013 Onirose released her debut single. She came into the studio to record a tribute song to celebrate the woman she admired growing up. That woman was her mother who raised seven children. What started out as just a tribute song later turned into a new career. Thrilled by the encouragement of the producers for singing with such professionalism she began to persue a career in music. Since that time, Onirose has been noticed by major media blogs, and media outlets. Her lyrics flow from her own creative process, and are taken directly from her own experiences. The singer has recorded and released singles like”I got it”, produced by award winning producer Richie Loop. Colaborated with Charly Black on a single called “Get it In” and did a single featured on the Dark Temptation Riddim called “I had Enough”, produced by award winning producer Troyton Music. “I Got It” is the 4th single released by the singer during the year of 2016. Produced by Richie Loop of Small-Box records in Jamaica and collaboratively written by said Producer and Artist (Onirose). It is an uptempo, modern dancehall track with a hint of Americam pop. 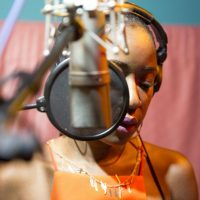 Onirose contributes her influences as Michael Jackson, Whitney Houston, Bob Marley, and Vybz Kartel. She covers a wide range, and refuses to be limited to one specific genre. The singer is currently working on a major project, but she refuses to give further details until the time is right.